Oil on canvas, 12 ½ x 16 5/8 in. Though his reputation is tied to subjects drawn from contemporary urban life, Miller insisted that the human body itself was his chief interest. 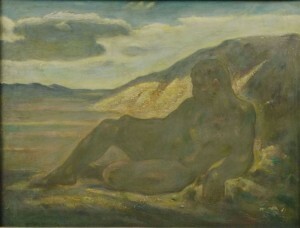 Recumbent Figure demonstrates the centrality of the human figure in Miller’s oeuvre from the beginning of his career. As early as 1897 Miller commented that the Renaissance was “the source that I find most fruitful in inspiration and example,” and much like his later images of female shoppers, Recumbent Figure hearkens to Renaissance precedents in the form’s solidity and sculptural presence. However, the painting’s dreamlike atmosphere is in keeping with the romantic, symbolist works that he produced around the time of the Armory Show. In a letter to Mrs. Grace Pagano, dated June 12, 1944, Kenneth Hayes Miller Papers, Archives of American Art, Smithsonian Institution, Miller wrote: “I am not interested in subject matter of any particular kind. I touch contemporary life in themes relating to shopping, but what has absorbed me has always been simply the body…” Quoted in “The Kenneth Hayes Miller Papers,” Archives of American Art Journal 12:2 (1973), 23. Letter dated November 9, 1897, Kenneth Hayes Miller Papers, quoted in “The Kenneth Hayes Miller Papers,” 20. Lincoln Rothschild, To Keep Art Alive: The Effort of Kenneth Hayes Miller, American Painter (1876-1952) (Philadelphia: The Art Alliance Press in Association with the Whitney Museum of American Art, 1974), 26. Kenneth Hayes Miller Papers, quoted in “The Kenneth Hayes Miller Papers,” 21-23. The prominent American painter and teacher Kenneth Hayes Miller was born in Oneida, New York, and trained at the New York School of Art and the Art Students League. He studied with some of the leading painters of the Gilded Age, including William Merritt Chase, Kenyon Cox and H. Siddons Mowbray, who encouraged a respect for tradition and craft that would become a hallmark of Miller’s mature style. After a trip to Europe in 1899, Miller was invited to teach at the New York School of Art, where he remained until 1911. From there he moved to the Art Students League, where he taught intermittently until 1951. Miller’s greatest legacy was arguably as a teacher and many of his students became well-known painters, including Rockwell Kent, Edward Hopper, and Reginald Marsh. See Lincoln Rothschild, To Keep Art Alive: The Effort of Kenneth Hayes Miller, American Painter (1876-1952) (Philadelphia: The Art Alliance Press in Association with the Whitney Museum of American Art, 1974). In a letter to Mrs. Grace Pagano, dated June 12, 1944, in the Kenneth Hayes Miller Papers, Archives of American Art, Smithsonian Institution, Miller wrote: “I am not interested in subject matter of any particular kind. I touch contemporary life in themes relating to shopping, but what has absorbed me has always been simply the body…” Quoted in “The Kenneth Hayes Miller Papers,” Archives of American Art Journal 12:2 (1973), 23. Lloyd Goodrich, Kenneth Hayes Miller (New York: Arts Publishing Corporation, 1930), 9. Letter to Rockwell Kent, March 1913, Kenneth Hayes Miller Papers, Archives of American Art, Smithsonian Institution, quoted in “The Kenneth Hayes Miller Papers,” 21-23.